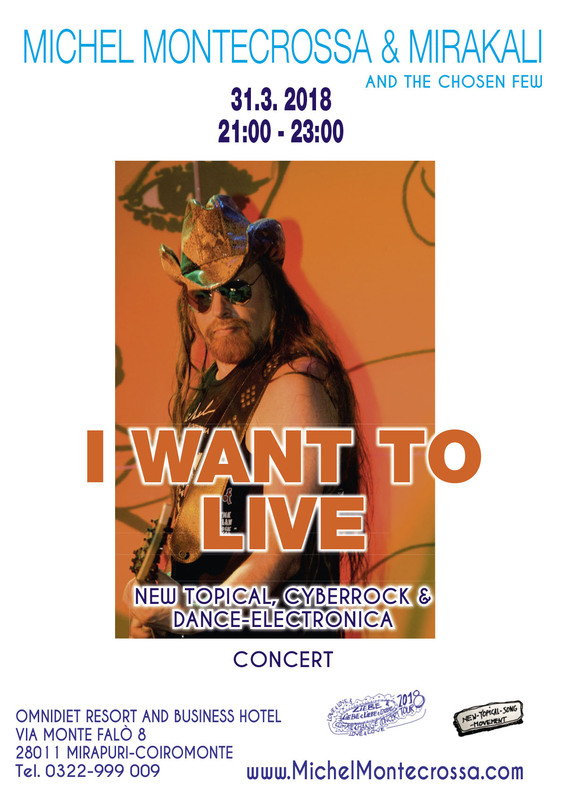 Michel Montecrossa together with Mirakali and The Chosen Few play the ‘I Want To Live’ New-Topical, Cyberrock & Dance-Electronica Concert on 31st March 2018 in the Omnidiet Music-Hall in Mirapuri triggered by the ’March For Our Lives’ in Washington DC. Before the concert you can see THE ENERGY OF ART Exhibition of new Michel Montecrossa paintings and drawings in the Mirapuri New Art Gallery of the Omnidiet Resort and Business Hotel. I want to live – always more. I want to live – down to the core. I want to live – down to the bone. I want to live, I want to be strong. Ich will leben – immer mehr. Ich will leben – den ganzen Weg. Ich will leben – stark und stärker. Ich will leben, nicht nur Überleben. I want to live – to love you strong. I want to live – to be young. I want to live – futureproof. I want to live, for you to be the clue. Ich will leben – um dich zu lieben. Ich will leben – jungen Frieden. Ich will leben – zukunftssicher. Ich will leben und sein deines Rätsels Lösung.